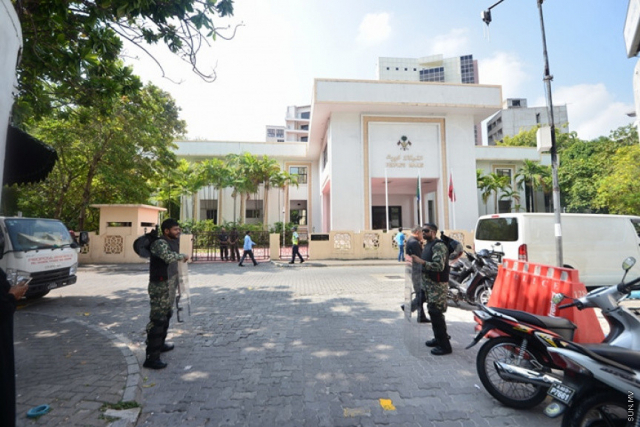 Security forces have closed down all the streets surrounding the People’s Majlis premises ahead of the extraordinary Majlis session scheduled for 11 am this Monday to make a decision on the State of Emergency. President Abdulla Yameen invoked a State of Emergency in the country on February 5, following an unprecedented order by the Supreme Court to release nine politicians and reinstate 12 MPs, on February 1, which the government says was part of a coup attempt. The Supreme Court has since annulled its order to release nine politicians, and on Sunday, ordered a stay on the reinstatement on 12 MPs. Access to the Majlis has also been denied to the media. “Sun”s reporter at the scene reported witnessing reporters working for some media stations instructed by police officers to exit restaurants near the Majlis. The 15-day State of Emergency will end on Tuesday, February 20. The Constitution calls for the reason for the invocation of a State of Emergency to be submitted to the Majlis within 48 hours. And if a State of Emergency is invoked before the Majlis session begins, then a meeting must be scheduled and a decision made within 14 days. The declaration of a State of Emergency must be backed by the Majlis. The Majlis has the authority to cancel the decree, and grant any extension to the period.